It is decidedly shortsighted to make only one bagel, especially a bagel this good. Perhaps that is why in the past 36 hours I’ve made this recipe three times. 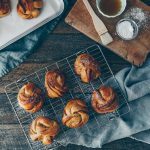 Bagels — for anyone who has ever eaten a proper one and knows how very different they are to a roll with a hole in the centre masquerading as a bagel — can be a touchy subject. 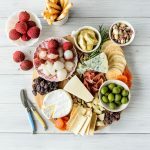 They must be dense enough to hold up to a shmear or gooey cheese egg, chewy on the outside due to boiling before baking, but just tender enough in the centre as to not dislodge your front teeth with the first bite. It’s a delicate balance and one that, by any traditional recipe, is a 24 hour commitment. Extended kneading and resting of dough, a very slow refrigerator rise, a bubbling cauldron followed by a searingly hot oven. I made them once, ages ago, and haven’t bothered since. As such, when I stumbled across a bagel recipe for one on my assigned blog for this month’s Secret Recipe Club I simply couldn’t resist. I could have gotten lost for days in the recipe archives of The Spiffy Cookie. There must be hundreds upon hundreds of creations and each sounds better than the last. 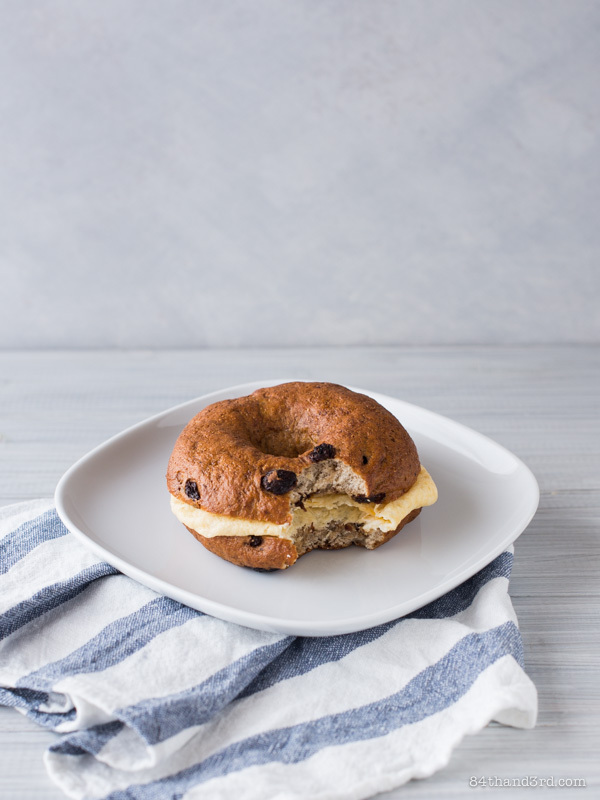 As per usual I started with breakfast and after drooling on my keyboard due to french toast and pastries and infinite granola combinations my eye landed on Erin’s Cinnamon-Raisin Bagel for One. It was just the inspiration I needed. 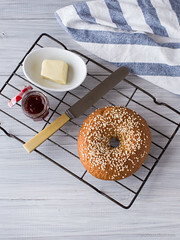 Of course I couldn’t let well enough alone and so I took the general idea and applied it to create a slightly more traditional bagel recipe, pared down for a single serving and simplified for a quick fix. Because how else would you — in under 60 minutes — find yourself chomping down on a piping hot, chewy and just dense enough, nearly proper bagel? There is a rest and two rises, but quick ones thanks to a handy little trick with hot water. The dough is dense, but kneading a small round is so much less labour intensive than for a slab of dough six times the size. There is a quick simmer in a skillet before baking because we are making bagels after all. It’s over almost before it started and all of a sudden you’ve eaten your bagel and are contemplating doing it all again. In other news, I decided to document the process on this one, because why not (or more accurately, because crazy). So if you are wondering what the steps look like, here’s something I’ve prepared earlier. Of course, as I didn’t plan on making it into a video montage until it was all done and dusted, there is a distinct lack of the baking step — but does anyone really need to see something being put in an oven? I don’t think so. I’m sure YouTube commenters will be wonderfully complimentary about having to actually read the recipe, however I have bagels and they don’t. So I win. In under an hour you can win too. Mix water, yeast, honey in a jug — proof 5 mins. Mix in flours and salt — turn out and rest 5 mins. Knead dough with a bit of extra flour for 3 mins until smooth. Rub with oil, return to jug, cover and set in a bowl of warm water to rise 15 mins. Knead twice, make a ball, poke a hole in the centre, spin and pinch to create a ring. Set on a pan lined with oiled baking paper, cover with oiled plastic, and let rise over warm water 15 mins while the oven preheats to 210°C (410°F). Bring water, syrup and soda to a boil as the dough finishes rising. Slide bagel in and simmer 1 min, flip and simmer 1 min, flip back over, remove and place back on greased paper. Sprinkle immediately with sesame seeds. Bake 12 mins and cool on rack. Place a glass measuring jug in a bowl of hot tap water. To the jug add water, yeast, honey and stir to combine. Allow to sit 5 mins. Remove jug from bowl, beat white flour into yeast mixture, followed by salt and wholewheat flour. Scrape out rough dough onto flour-dusted bench and invert jug over top. Rest 5 mins. Using an extra tsp or two of flour, knead dough 3 minutes until smooth and no longer tacky. Rub dough with a drizzle of olive oil, return to the jug (no need to wash it) and cover with plastic wrap. Place jug back in the bowl with new hot tap water and leave to rise 15 mins. Line a pan with baking paper and lightly grease the paper. Remove plastic wrap from jug, grease one side and set aside for later. Turn dough out onto bench top and knead twice. Form into a ball and stick your finger into the centre to create a hole. Spin on your finger(s), stretching and turning to create an even ring. Set on prepared pan, cover with the greased side of the plastic and place pan over a bowl of hot tap water. Leave to rise 15 mins, immediately turn on oven to preheat to 210°C (410°F). When the 15 mins has elapsed bring simmer solution ingredients to a boil in a small frying pan. Remove risen dough from paper with oiled fingers and gently slide, rounded side up, into the water. Simmer the floating dough for 1 min, flip gently with a fork and simmer a further 1 minute. Flip back, immediately lift with two forks to drain, place back on greased paper and sprinkle with sesame seeds. Bake 12 minutes then cool on a rack. I use US Tbsp for all my baking — a US Tbsp is 15 ml, whereas an AU is 20 ml and UK closer to 18 ml — hence the 45 ml water measurement. Add the baking soda to the water before it reaches boiling otherwise it will act like a kindergarden volcano experiment. While the resulting overflow makes for a great stove cleaner it’s probably not the result you’re going for at that moment. Trust me on this. 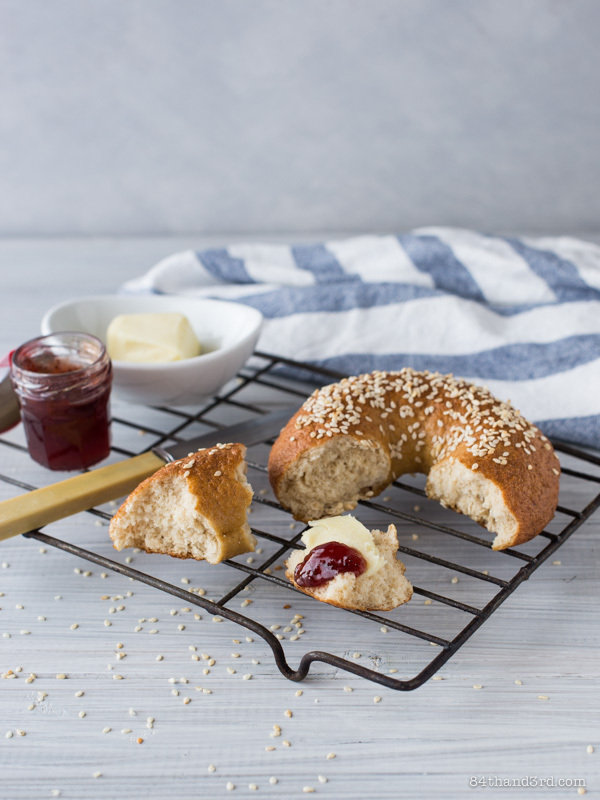 Sprinkle any toppings on the boiled bagel as soon as you remove it from the simmer solution and before it dries, otherwise the seeds won’t stick. Barley malt syrup is very traditional in bagels. If you can’t find it, you can substitute honey or rice malt for the simmer solution. Similarly you can replace the honey in the dough with another syrup of your choice. Make recipe according to Honey Wholewheat Bagel for One method up until you knead the dough for 3 minutes. 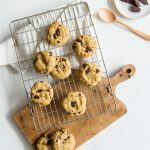 After kneading for 2 minutes, flatten dough out with your hand, sprinkle over cinnamon and raisins, roll up to enclose and knead for a further minute. 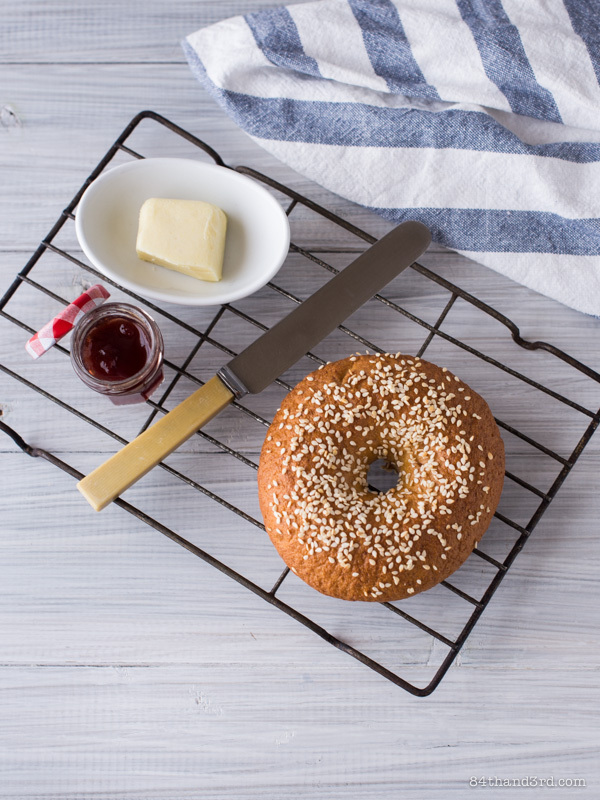 Continue with Honey Wholewheat Bagel for One method omitting sesame seeds before baking. I love the idea of single servings but I was thinking the same thing. One bagel would not be enough. I would probably be looking for one each day. Hello there, JJ! Great post, I loved the video, what a cool idea that was! Hope you have a chance to stop by…. YUMM!! I’ve never tried bagels at home, but now I HAVE TO! These look so fantastic! I like that you tried out one of my single serving recipes! It’s definitely a little odd to only make one bagel but it is done so quickly! Glad you enjoyed it. BTW, love that you made a video of the process! Fantastic pick! I particularly love the trick of putting the bowl in warm water. Genius idea, particularly on a cold morning. As a native Montrealer, I can affirm that bagels are indeed a touchy subject ;-). 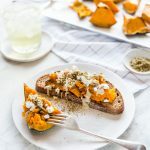 I’ve yet to make my own and the fact that this recipe is for one somehow makes it feel less daunting — plus, there’s a cool video. Wanted to drop in and say hello — I discovered your blog and delicious quinoa stir-fry through Sally (bewitching kitchen). JJ, I love this idea! I make all kinds of bread all the time, and I eat way too much of it. This could be the way for breadaholics like me to take control! This is awesome! I’ve always been too intimidated to try making bagels because it seems like such a huge project… I love that this makes just one!! So doable!! What a great idea to possibly keep me from overindulging. I think this is the best group D recipe yet! Your photo stylist is lovely, by the way. How cool that there is a recipe for a bagel for one!!! Looks beautiful and your photography is stunning as always. What a fabulous video montage! I can hardly wait to try this recipe. I’m pinning it right away to my “recipes I’m dying to try” board. Beautiful photos! Love the idea of single serving size. Gorgeous photos, as always! This is a neat idea to make a bagel for one! Great SRC pick! What a clever idea and I LOVE your montage! Oh JJ how clever you are! I think making one at a time is a good thing with recipes this delicious. That way you have to really want another one and can’t just devour 4 in one sitting. Awww I miss proper bagels! I’m the kind of person who makes a double batch “just in case it’s delicious” though. lol. This is absolutely brilliant! 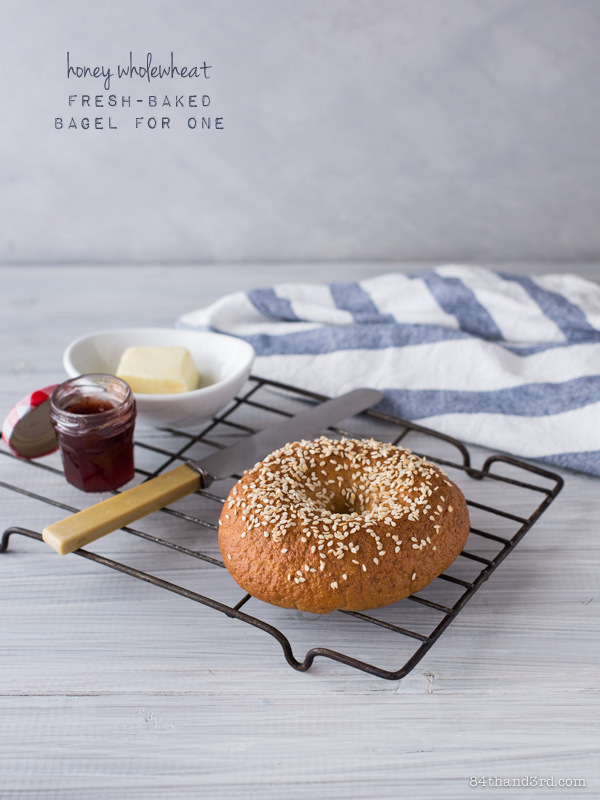 I love bagels and there’s nothing better than a fresh one so this is a must try!